With the increase in popularity of sportives and everyone wanting to try cycling there’s been something of a demise in riders going on club runs and learning from the old boys how to do things. The preference for sportives over club runs might be because there is less worry about getting dropped as all sportive routes are signposted – no chance of being lost and abandoned in the hills. This increased popularity and demand for sportive events means the sportive market is growing rapidly. With greater publicity and backing to go with the increased interest, more riders are able to enter each event leading bigger groups riding together on the roads, creating large pelotons. 16,000 people took part in the RideLondon-Surrey 100 two weeks ago, many of whom were doing their first event. All these riders, often of varying abilities, means there is less room for error. 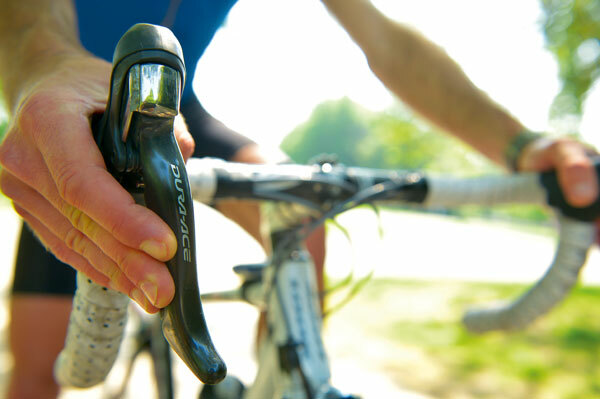 Making small mistakes during these events can cause you to get dropped or, worse still, lead to accidents, so knowing exactly what’s going on and the best way to get yourself through a sportive safely is vital. It’s often said that experience is gained through trial and error. Getting things wrong helps you learn the correct way of doing it, but in bike riding sometimes the right answer or the correct way isn’t too obvious and it feels like you are continually struggling and getting it wrong. Everyone out on the sportive road is focused on bettering themselves and there are loads of nifty old school tricks that make riding a bit easier, whatever your level. We all know it can be a little embarrassing or awkward to ask your peers what to do and while trial and error is a valid way of learning why waste your time on mistakes? We’ve answered the most commonly asked questions we’ve received in our Q&A post-bag and from meeting riders at events. When should I be eating during a sportive? Keeping fuelled and hydrated when riding any distance is vital, as bonking is not something you want to do. Eating a little bit, possibly half a bar or a small piece of flapjack every half hour is a good rule of thumb to follow. This takes into account sportives of any distance as well as your fitness and means you stay fuelled for however long it takes to get round. What do the signs people in front of me keep doing actually mean? A downward point warns of a pothole or something that you will want to avoid. When a rider in front sweeps their left arm across their back, from left to right, it means you need to move out to go round a park vehicle or obstacle, if it’s done with the other arm, right to left, it’s to keep in to the left as there’s something coming. Repeated patting of the air, by their bottom, indicates slowing down. When should I change gear while climbing? When climbing, changing gear under pressure puts more strain on the chain – ease the pressure off as you shift to prevent it jumping. Anticipate the need to change gear by looking ahead and change into a lower gear before it becomes too steep, so the chain is not under too much pressure. However don’t change gear too early as you will end up spinning and prevent you from putting any power down. What cadence should I be riding at? This is personal to each rider and something developed over time. Some riders prefer to ride at lower cadences while other riders like to spin – there’s no right or wrong answer. Even professional riders vary their cadence but generally coaching encourages riders to work toward the faster cadences. Most riders sit somewhere between 80-100rpm. Any lower than 80rpm you are pushing too big a gear and much higher than 100rpm you’re in too low a gear. Use your gears to make sure you keep your cadence within the optimal window. When the terrain heads uphill cadences drop by about 10rpm, while when descending you can find yourself spinning out. How do I avoid saddle sores or chafing? Different types of pain in the nether regions mean different things. Chaffing is often down to shorts choice, so ensure yours fit properly. A bruising feeling is a hint that you may be riding the wrong saddle, and sores are often down to personal hygiene so ensure you wash yourself and kit after every ride. Chamois cream can help alleviate chafing if you’re still having major problems after checking these things. On multi-day stage races the constant continuous pressure and long hours in the saddle can cause pain and sores. Many pro riders have had to take a knife to their saddle to re-shape it to accommodate particularly painful bottom boils and allow them to continue racing. Almost certainly you will be fit enough to get round but you may have to moderate your expectations. There’s no point expecting a super-fast time on a 100-mile hilly route if you’ve only ever done 50-mile events before – but you may well be able to finish. Be realistic; with the correct nutrition and pacing you can get round most distances, but it’ll be hard and will take a lot longer. If you have ridden two thirds of your goal distance in training and a speed close to your target you should be fine on the day. It will be tough but the atmosphere and the presence of other riders to help with the work will keep you going – as long as you stick with your pacing and nutrition. This depends on weather, but taking a cape or gilet is a must as having to stop for mechanicals or descending can chill you very rapidly. On hot days, shorts and jersey with a thin undervest is plenty, adapting this with a thicker base-layer, gilet, arm and knee warmers is enough for cooler days and gives options for removing garments when it heats up. During much colder rides layers are needed, as well as thermal long tights and windproof thermal jackets. The key is layers, keep an eye on the weather forecast in advance but take a judgement call on the morning and remember that if you need to take the layers off they’ll either need to fit in a pocket or risk being abandoned. Newspaper down the front of your jersey or a plastic bag is perfect for early starts where the temperature will definitely rise as once you start to heat up they can be responsibly discarded. How can I corner faster? 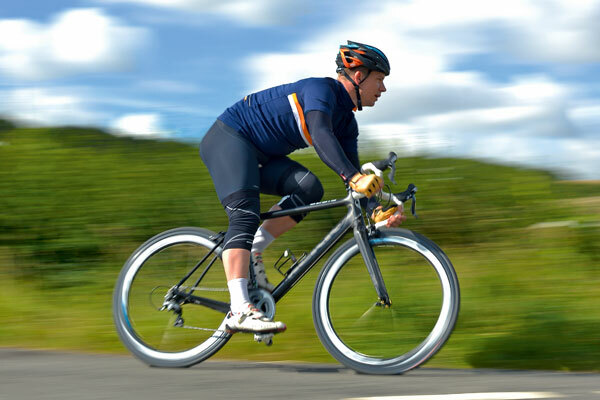 Improving your cornering confidence is an easy way to get quicker without even having to improve your fitness. The key to cornering is taking the correct line: wide then sweeping in to hit the apex and then exiting wide again. However do remember sportives are on open roads so don’t take silly risks to hit the right line. Keep the inside pedal up, put your weight through your outside leg to keep grip, and do your breaking before the corner not during it. Sportives aren’t races and as such riders are scattered around instead of compacted in an organised bunch, so keep a careful eye out, especially a shoulder check if you are swinging wide as other riders might be picking other lines or trying to overtake without warning. Using feedback from heart rate or power is a good method of judging pace, knowing how different zones ‘feel’ is important. This is something that you need to learn and practice on your training rides. There’s no harm in occasionally misjudging it or even deliberately pushing yourself harder than comfortable to see how long you can last – do it in training and there is nothing lost but you’ve gained knowledge on how to pace yourself. You don’t necessarily need loads of high-tech tools, just monitoring your breathing and effort level is enough. If you’re aiming for a time, your riding pace needs to feel hard but manageable, breathing should be deep but if you can’t talk in complete sentences you are going too hard. You may be able to sprinkle a few harder efforts in to make it up the hills but ensure you don’t go into the red zone where your legs start to burn and your breath becomes gasping. If you just want to ‘get round’ obviously you can take it at a much more leisurely pace but remember the pay off is you’ll be out longer which brings its own problems with fuelling and fatigue. Even at a ‘get you round pace’ you should still be aware that you are breathing at a deeper than normal rate. Why do I keep blowing up? Blowing up during a sportive is usually due to two main reasons: not fuelling properly or poor pacing strategy. Basically you need to ensure you ride within yourself enough to make it through the entire event, as going too hard too early or going too far into the red over a big climb can cause you to blow up. You need to aim to consume 60g of carbohydrate an hour. Most bars contain 20-30g, a gel around 20g, 500ml of carb drink 20g-30g, and a banana 30g, so pick and mix how you obtain your carbohydrate. If you regularly forget to eat in rides or don’t eat enough, set an alarm on your watch for every 20 minutes and aim to eat something each time and drain your 500ml bottle every hour. This can also help to break down the ride into different sections to help keep your focus and help with your pacing. How can I be faster on descents? Keeping it smooth is key when descending. Slamming brakes on and then pedalling furiously is inefficient, slower and also dangerous. Getting on the drops lowers your centre of gravity, giving more control and makes it easier to cover your brakes. As you’re faster when descending leave a bigger gap between you and the rider in front and look further ahead than usual as potholes and other obstacles come up quicker. Should I bother to warm up? This depends on the event you’re riding and what your aims are. For example, if you just want to pootle round and have a bit of a social on a 100-mile sportive a warm up is probably not vital, whereas if you wish to smash a 30-miler you may want to prepare yourself mentally and physically for the event. Warm ups are often important for fast starts or if the route hits a steep hill immediately. They can vary from rolling up and down the road to a full blown, progressive effort with some sprints on the rollers. If you are in a big sportive and going for a quick time a warm up can be beneficial as the front groups often start very fast and if you can stick in there – without burning yourself up for the rest of the event – it can help get you the finish time you want. What mistakes have you made in sportives? Were they avoidable? How will you prepare better next time? Rachel Perry: Thinking that 100 miles of flat road would be ‘easy’ #flatoutinthefens bonked, and fell off at mile 95! Paul Jones: Left my Garmin at home on the Abergavenny Iron Mountain 100, no idea of time, distance, heart rate or speed – nightmare! Thurstan Johnston: Starting off far too quickly and not pacing myself. Also not fuelling properly, only eating when I have run out of energy. Terry Ottaway: Riding alongside someone who doesn’t know what holding your line is, verged it but stayed upright. Duane Bridger: Only filling one water bottle at the feed station in order to save weight – last 10 miles were slow and thirsty!! This article was first published in the August 22 issue of Cycling Weekly. Read Cycling Weekly magazine on the day of release where ever you are in the world International digital edition, UK digital edition. And if you like us, rate us!